Most companies on the move require that employees pack up their own office or cubicle space, including desk, filing cabinet and personal items. Use these tips to prepare for a move so when the day arrives, your things won't get lost in the shuffle. The first step as an employee is to ask your boss if there are any restrictions on what you're allowed to take to the new office if there are plans for new furnishings, and if so, what they are, including the size of desk and drawer space. Make sure you know the "rules" before you start packing, including the move date, what to do with unwanted furniture and how to dispose of unwanted documents. If possible, ask to see a blueprint of the new office, including where you'll be located as an employee. This could influence your decision on whether plants move with you (depending on light) or if you'll need to purchase a tea kettle now that your new office is located on the opposite side of the kitchen. The first place to start is to clear out the clutter and sort the filing cabinet. It's the biggest job and might require more time than your desk. First, find out from your employer which documents are not required space, then ask which can be recycled and which need to be shredded. This might already be part of your company's protocol, but in case it isn't, ask. Once you know what you need to take with you, start going through the files, making specific piles - to take, to recycle, to shred - and keep each separate. Place the files/folders that are being moved in order (alphabetically, numerically, depending on how they're arranged) in a file specific box. If you use a box that is too big for the files, you might find the folders will shift during the move and the file contents might get shuffled. Mark the box with your name, the new location (if you have that information) and if the information contained in the box needs special handling; this may include confidential information. Make a note on the box of its contents. If you're in the middle of a project, this is essential to keeping on top of your work. Empty every drawer and sort through the paperclips, notepads, and other supplies. Keep some and donate the rest to your favorite school or other charity. The key is to only take with you what you need. 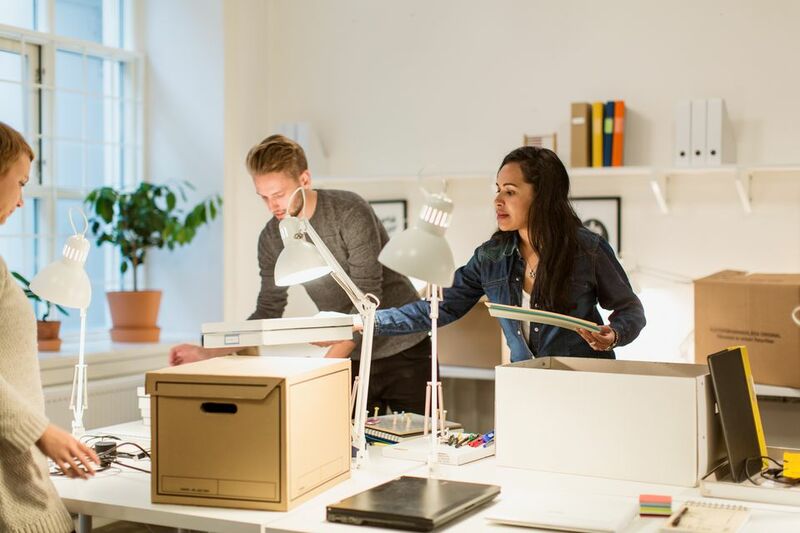 If your employer knows what your new space will look like, its size and how much the space can accommodate, then you can make some decisions about what stays and what goes. Ask your employer or manager what you do with extra furnishings or supplies. Ask the person in charge of the move if you're responsible for backing up your computer and preparing equipment for the move. Remember, that the equipment you're planning to move will need proper packaging. This is the time to start rounding it up. When it comes to personal items, the main questions to ask yourself are: how much room will you have in the new space and what will it look like? Personal items, such as pictures, framed posters, etc. might not work in the new office if you have limited wall space. If you're contemplating moving plants, find out if you have a window in the new office and which way it faces to determine if plants will like the new space. Take all personal items home, in particular, those that you value, just in case they get lost in the move. The company moving insurance might not cover expensive artwork if it is damaged in the move. If you're unsure, ask the person in charge. Often, companies will tell employees what they're allowed to move and what must be taken home, usually because of insurance issues.